TSRTC started new website www.tsrtcpass.in -Introduced Students Bus Pass online Application form for Apply students bus passes online, Telangana State Road Transport Corporation owned by Government of Telangana has announced online application for two types of students bus passes can be Submit online, Student bus pass up to SSC ,and Student bus pass above SSC. these two applications students can apply online , who are pursuing 10th class or above 10th class students bus passes online application available on www,tsrtcpass.in , It is official website of Telangana State Road Transport Corporation.TSRTC stated this service for student who pay student bus pass standing in long Queue, avoid long Queue Student can apply student passes easy method, and timing also save.This also includes bus passes of MCT, Vanitha, Cat Card, Navya Card through Online. Who apply TSRTC Student Online application form ? TSRTC is committed to provide consistently high quality of services and to continuously improve the services through a process of teamwork for the utmost satisfaction of the passengers and to attain a position of pre-eminence in the Bus Transport sector. Student bus passes online application service, who apply for bus passes every year. this academic year really good news for those students apply bus passes. Every year lakhs of student traval one place to another place through TSRTC. Telanga government provide this facility for student apply student buspass very easy through online. How to apply Student Bus passes online ? 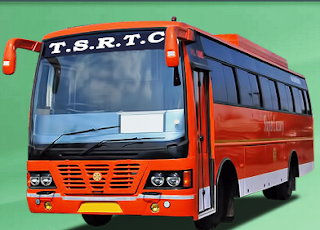 Telangana Students who are applying bus pass,studying 10th class or above 10th class, those students can apply their bus pass online through TSSRTC ( Telangna State Road Transport Corporation ) official Students bus pass website http://www.tsrtcpass.in/ . STEP -5 : Route Details ( Center/ Pass Type Required ) After filling the Application form Click on "Submit" Button. Download the Application form and Bus pass.